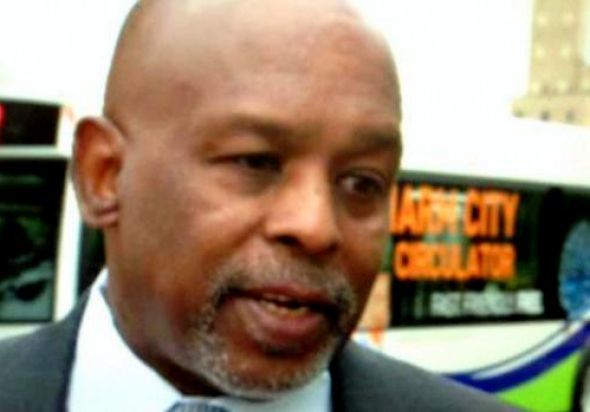 Above: Former Circulator bus chief Barry Robinson pleads guilty to federal bribery charges. A former high-ranking official in the Baltimore Department of Transportation today pleaded guilty to two federal counts of bribery and one count of money laundering in connection with bribery schemes involving the Charm City Circulator. Barry S. Robinson, who headed the free bus system until days before his indictment in October, pleaded guilty to taking a $20,000 bribe to cancel Circulator advertising owed to the city and accepting $70,000 to sell city bus shelters, U.S. Attorney Rod J. Rosenstein said this afternoon in announcing the guilty plea. As the division chief of DOT’s Transit and Marine Services, Robinson had authority to approve contracts with advertisers and vendors and to purchase and pay for goods and services. Robinson, who joined DOT in 2006, was responsible for the Circulator since its inception as a free downtown transit service under Mayor Sheila Dixon. In spring 2013, Robinson received a check for $40,000, payable to the Baltimore Director of Finance, in payment for advertising on Circulator buses. Robinson returned the check and proposed that for $20,000 in cash, he would cancel the $40,000 debt to the city and provide written documentation that it had been paid. The debtor declined the offer at that time. Then last January, Robinson renewed his offer to cancel now $60,000 worth of advertising in return for $20,000 in cash. Between January 23 and March 11, 2014, Robinson received four cash payments of $5,000 each from “Person A,” according to the federal indictment. In return, he provided a signed letter on Baltimore City letterhead falsely stating that the $60,000 debt had been paid. Robinson also admitted that he took a $70,000 bribe to sell unused city bus shelters. In 2011, he arranged for the city to purchase 13 bus shelters from a Canadian company for $249,290. On several occasions between May 2013 and March 2014, Robinson tried to sell the shelters, which he had reportedly stored in a secret location after DOT “lost track” of the equipment. On April 9, 2014, Robinson accepted $70,000 in return for the bus shelters. Seeking to disguise the source of the bribery proceeds, Robinson deposited the cash payments he received into two bank accounts in the name of another person, and used a portion of the proceeds to install carpeting, televisions and a range hood in his Southern Maryland home. Robinson, 65, faces a maximum sentence of 20 years in prison for money laundering and 10 years in prison on each of two bribery counts. Chief U.S. District Judge Catherine C. Blake has scheduled sentencing for March 27, 2015.